Silver grew into a widely published poet whose work is noted for divining the transcendent in unlikely places — the post office, a drive through fog, the laundry room (see “Canticle to the Washing Machine”). She shares that rapturous world-view with students at Mercer, where she teaches English, along with her playwright husband, Andy. This fall, Louisiana State University Press published her first book of poems, The Ninety-Third Name of God, which earned her the “Artist of the Month” designation from the journal, IMAGE, and is expected to establish her as one of the country’s leading literary voices. “These poems reveal the word made flesh — incarnate experiences cracked open to light, celebrations of the meaning found in suffering and in healing, in death and in birth,” writes Jill Baumgaertner, poetry editor of the Christian Century. God knows, it is difficult enough to persevere as a poet under ordinary circumstances, but for Silver and those who love her, this collection reverberates with heightened meaning because it draws from such profound and bittersweet inspiration. She was pregnant, preparing to bring another life into the world she reveres, when, in the second trimester, she received another medical diagnosis: inflammatory breast cancer. It was the aggressive kind — “rare as hen’s teeth,” the doctor said — with the odds of survival for another two years estimated at one in five. She was 35 at the time; her husband’s mother had died of breast cancer at 42. Assured that chemotherapy would not harm her unborn child, Silver began a grueling regimen. As her belly swelled, she lost her hair, and her body suddenly became the ultimate metaphor. She finished her first round of chemo in April of 2004, and the following month, her labor was induced early and she delivered a healthy son, Noah Samuel. In an early photo, both mother and baby are bald. Silver resumed her treatments and underwent a mastectomy, followed by radiation therapy. Then she began to write with life-or-death intensity. Some of the poems that accumulated on her desk resonate like triumphant hymns; others pierce like lamentations. Her work is exquisitely accessible, but not at all simplistic — celebrating the flesh along with the spirit, this world as much as the next, and mysteries as much as certainties. Silver went into remission for five-and-a-half years. Her hair grew back. Noah entered first grade. She was preparing for her big book launch. Then came the news: the cancer has recurred. Her grandfather had been murdered by Stalin, and her father was a refugee who brought her up in the Russian Orthodox Church. She attended Haverford College before heading South to Emory for graduate school, where she met Andy, also of Russian descent, but Jewish. Anyone who has seen “Fiddler on the Roof” knows that just a few generations ago on the steppes, their union would have meant trouble, if not a death sentence. In a poem titled “Marrying Outside the Faith,” she writes movingly about what each surrendered, and gained, in their respective religious identities. “I still love the sights and smells and introspection of the Russian Orthodox Church, but it’s a little too conservative for me,” she says. The couple moved to Macon to teach at Mercer in 1997 and settled into an industrious, academic lifestyle, enriched with scribbling, social activism, and Sunday mornings at an Episcopal Church. She had a couple of miscarriages before conceiving Noah and then encountering the dark muse she did not want. Still, Silver says, she has been told that her writing, with all of its exultation and exaltation, could use more rage. “I don’t want to be the Angry Cancer Poet!” she says. The process functions as a form of prayer, she says, as well as a way of addressing the hard questions of theodicy, or suffering. Elmo Shropshire was driving around San Francisco in the late 1970s when he tuned in to the middle of a lively debate on the radio. Several listeners had requested a song with great enthusiasm; a few had complained about it just as fiercely. The deejay, sensing an attention-getter, put the needle in the groove. Then Shropshire heard his own voice warbling in an earnest treble. “I was shocked at just how awful I sounded,” he recalls. He had recorded it as a lark, with no grander ambition than giving it to friends as gag gifts and possibly selling a few singles for pocket change. At the time, Shropshire was working as a veterinarian by day and performing on the side in an Americana lounge act dubbed “Patsy & Elmo,” forming a duo with his then-wife, Patsy Trigg. One of the couple’s fans had submitted their silly little record to the radio station. The ditty’s hook turned out to be catchier than Shropshire had ever imagined. His gleeful, nasal delivery of lyrics describing an eggnog-soused matriarch who gets trampled to death by one of Santa’s draught animals fell into that peculiar “so bad, it’s good” category of pop culture, providing, for many listeners, comic relief from the sentimental soundtrack of the holiday season. “Grandma Got Run Over by a Reindeer” went multi-platinum, selling more than 11 million copies. It quickly knocked Bing Crosby’s “White Christmas” from the top of Billboard’s holiday charts and inspired a sprawling, ongoing franchise that includes heavy-metal and foreign-language covers, an animated movie, spots on various film soundtracks, and an array of plush, singing reindeer toys and blinking, collectible keepsakes and kitsch. Moreover, “Grandma” has proved remarkably spry in keeping up with changing times. The video, an early favorite on MTV, has gone viral on YouTube; the ringtone earned a No. 1 “gold” ranking in its first year; and Shropshire’s home-based company, Laughing Stock Records, just released a nifty iPhone application based on the song. During the upcoming holiday season alone—more than 30 years after its release—the royalties will still add up to more than a jingle in the singer’s pocket. No one is more bemused by the “Grandma” phenomenon than Shropshire, a 1964 graduate of Auburn University’s School of Veterinary Medicine. A diminutive man with twinkling eyes, a thatch of snowy hair and a wardrobe heavy on bright red-and-green plaids, he long ago embraced the role of elf. “If it weren’t for that song, I’d still be worming cats for a living,” he says in his distinctive Kentucky drawl. Still, though “Grandma” gets most of the press, Shropshire’s varied exploits add up to more than a one-hit wonder. Born in 1936, Shropshire grew up on a farm in the horse country of Lexington. His father, who shared Elmo’s moniker, was the most famous jockey of his era. Known as “Little Shrop,” he rode more than 70 thoroughbreds to victory—until he grew. As a trainer, the young Shropshire broke in a sickly foal called Needles, whose nickname reflected the various medical injections he’d received for broken ribs and pneumonia. Needles became the first Florida horse to win the Kentucky Derby in 1956 and almost swept the Triple Crown. The thoroughbred’s legendary, come-from-behind success launched a boom in the Sunshine State’s horse breeding industry. When Shropshire was a teen, his parents were killed in a head-on collision. He worked to put himself through college, studying animal husbandry and chemistry at the University of Florida before his selection as one of 10 out-of-state students for Auburn’s rigorous veterinary program. He served as president of the Alpha Psi veterinary fraternity. After graduating, Shropshire worked with horses for a year in Miami and then won a coveted position as a veterinarian and equine inspector at the Belmont Aqueduct and Saratoga racetracks in New York. “It was a veterinarian’s dream job, with a great social life for somebody young and single,” he recalls. But Shropshire was hearing the call of a twangy new muse: the banjo. So he taught himself to play through intensive mimicry and, in 1967, relocated to the West Coast—just in time for the Summer of Love. 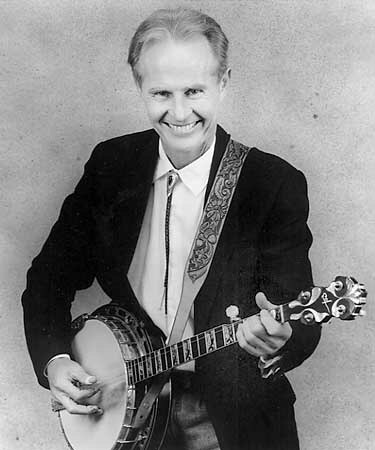 While establishing a small-animal clinic in the Bay area, Shropshire helped introduce the old-school music to the locals, playing in a band called Homestead Act and hosting a popular radio show, “The Great San Francisco Bluegrass Experience,” in which he interviewed his heroes, people like North Carolina pickers Earl Scruggs and Arthel Lane “Doc” Watson. He camped it up in rhinestone-studded overalls—“for formal occasions, we might wear black overalls that had tails like a tuxedo,” he says—but the group’s sounds, rehearsed with exacting discipline, were pure and authentic. Patsy Trigg joined the outfit with her high-lonesome vocals, and the band developed a loyal underground following. “We packed the house in joints that sat 15 or 20 people,” he jokes. One of Shropshire’s early devotees was Joe Wiercinski, a broadcasting student from Pennsylvania. After Shropshire and Trigg married, they started performing as a duo, touring on the casino circuit, where the animal doctor honed his claw-hammer chops and raspy, woodsmoke voice. One night during the holidays in Nevada, a blizzard left another band stranded at the resort where Patsy & Elmo were performing, and all of the musicians took the stage together. Still, the song’s macabre premise has had its detractors through the years. Turns out the protesters were part of the Gray Panthers, an activist group for senior citizens, decrying what they called the song’s “ageist” message. An ambassador of yuletide cheer, he has toured with Brenda Lee of “Rockin’ Around the Christmas Tree” fame and played with Bobby Helms, who did “Jingle Bell Rock.” After some unsettling competition from the meowing “Jingle Cats”—“I’d like to neuter them,” Shropshire famously quipped in an interview—the bluegrass picker with the “nom de nonsense” of “Dr. Elmo” joined Ray Stevens, “Weird Al” Yankovic, the Rev. Billy C. Wirtz and Frank Zappa in the pantheon of novelty music, where artful clowning is serious business. One such solicitation, though, has yielded a fruitful, long-term collaboration. “They say they could never duplicate the bell-brass tone of these,” Shropshire says, leisurely plucking and plinking the moon-face of his 1936 Gibson Granada—a twin to the hallowed instrument played by Earl Scruggs. So he practices constantly, when he’s not feeding corn to the herd of tame deer roaming the grounds of the Marin County estate that “Grandma” paid for.